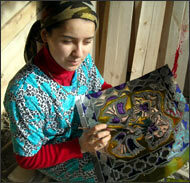 Every seventh citizen of Tajikistan is a labor migrant. People go to Russia and name it "second home". Every year in early spring people pack up and go abroad, looking for earnings. The official sources say that there are over 600 thousand labor migrants among Tajik citizens and 21.3 thousand of them are women. Unofficially, the real number of Tajik migrants exceeds one million. Speaking of female migrants, their average age is between 18-29. In 11 months of 2009 590 dead bodies were delivered to Tajikistan; of them, there were 40 women. At the round table, dedicated to International labor migrants, Kimmatul Aliberdieva, the deputy Chairman of the Committee for women and family affairs said "many women, working abroad have health issues. 26 out of 40 deaths were reasoned by various deceases". The number of women, dying outside of Tajikistan, is growing every year. If the migrant could foresee the troubles, they will face abroad, they would probably stay home and enjoy modest income. In Tajikistan they are not afraid of suppression, racket and bald neo-Fascists; they are not risking their lives to make a living. Historically, many occupations have not been designed for women. However, the collapse of Soviet Union, the stagnant economy and mass unemployment have changed historic traditions. Men go abroad for earnings while women take their jobs at home. 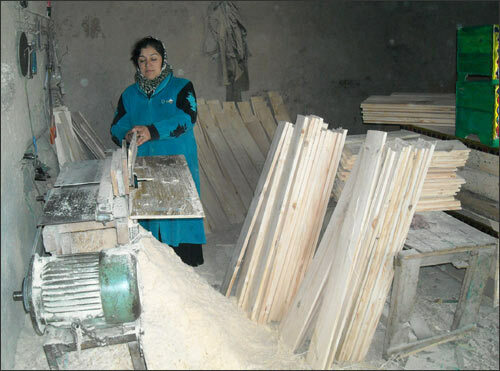 Tajik community has been witnessing how more and more women feel more comfortable with such male occupations as irrigators, crane operators, taxi drivers, brick layers, woodworkers and blacksmiths. 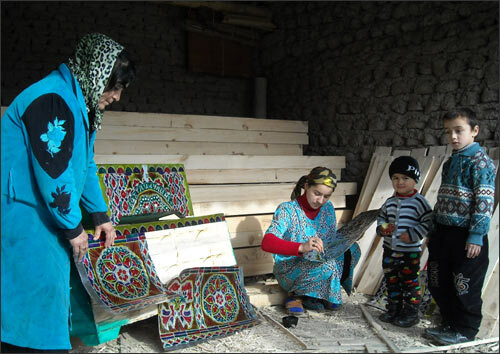 52-year old Mukhabbat Yuldasheva changed her profession 10 years ago. - My dad Mazbut used to be the carpenter and made boxes – Mukhabbat shares. – He taught basic technical skills to his children. Ten years ago I bought the machine and started the production of boxes. Today, Mukhabbat’s four daughters help run family business. Their items are demanded not only in Tajikistan, but also Uzbekistan and Kyrgyzstan. - I am not complaining. – Mukhabbat says. – Nothing is easy. I need to put best efforts to achieve the result. The most important is that I am home and feel comfortable. Karomat Alieva is a tiler. She’s been working as a tiller for 10 years. Graduating from technical school in Ukraine, Karomat lived 10 years in Donetsk. - Every time I was going back home people asked to do some works. I realized there are jobs in Tajikistan, but no specialists. I sold my apartment in Donetsk and moved back to Chkalovsk. Karomat has a good customer base. Today, she is very busy and has no leisure time. Khursheda Nuriddinova always wanted to be a flight attendant. 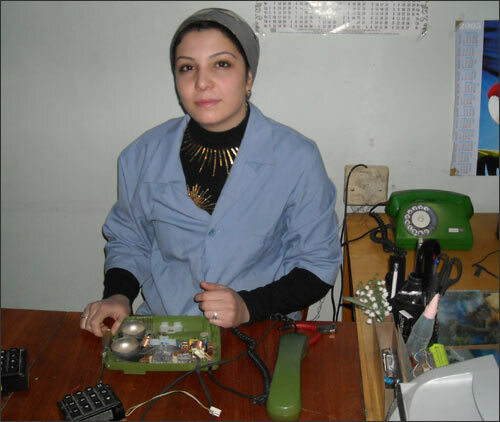 However, after graduating from Chkalovsk metallurgical college she worked as electrician at Tajiktelecom. Today, she is the electrician in the Sogd Oblast administrative office. - Not only I ensure uninterrupted performance of telecommunications at my area but also replace outdated wires, broken phones. I can also fix digital equipment – Khursheda says. She is happy that her husband and mother also work in the telecommunications industry. Emancipation – the natural part of our life. In the opinion of Rano Bobojonova, PhD in History, adaptation process is easier for women. Men are migrant workers; therefore, women replace them at home. The experts explain this as "female emancipation in the labor market". Over half of employees in law enforcement structures, banking industry, journalism, and telecommunications are women. - Today, the emancipation in Tajikistan is a normal event – Rano says. – Women represent half of population and they take men’s job locally. This is explained by migration, gender policy and our mentality.